Nobody sets out to build a chicken coop and says "I can't wait to screw this up" but yet, it happens. You read building instructions, you make plans and you do your research fully intending to not make the same coop building mistakes as everyone else. You are sure that this coop is going to be absolutely perfect. Well, at least we were! Even the best laid plans go awry and even though the chicken coop looks great when it's done, the day comes when you look at it and say I really didn't think this through did I? Whether the doors are too small, the roof is too low, you can't fit enough chickens, there's not enough light or there's too much ventilation (especially in a predators can get in sort of way) something went wrong. *sigh* I'm pretty sure we've all been there. The first coop we built was strategically set at the bottom of the yard. This was actually pretty well thought out believe it or not. It's a Wild West Saloon style coop my husband designed. It's right at the edge of the clearing and the chickens would be close to the house for carrying down feed and water but far enough away that hopefully they'd stay down in that direction and off the back porch. We figured the trees would give some shade in the summer and a place for the chickens to play and dig to their heart's content. The water runoff from hard rain's tends to go smack dab through the middle of the yard which is a good 25-30 feet away from the coop so that wouldn't be a problem. Treated wood was bought for the platform base, and the guys went on and on about how it costs more but it'll last longer. Amish hemlock was used for the rest of the chicken coop and I drove to the next county to pick up the special tin roofing. The coop went up flawlessly and it was beautiful. The chickens moved in and everyone was happy. Everything appeared absolutely perfect. Then the rains came. Unfortunately even though we had seasoned barn builders helping us nobody mentioned how water would run off all over the yard including the area in front of the coop. With the coop set flush with the ground the water had nowhere to go but into the coop. The husband decided that a French drain was in order. We picked up a load of rocks and dug out the entire area in front of the coop. We filled in with the varying sizes of rocks and then we waited. It stood up pretty good for the first few weeks then suddenly the French drain failed and the coop flooded again. By now I had a pretty good method for drying out the coop, but this game was getting old! At this point it was decided that the front porch of the chicken coop simply needed to be higher than the yard. I wisely stayed away for this part so I don't have exact details but I do know that tractors, shovels and jacks were used. Then it was all filled in and again, we waited. By this time it was winter and with the snow only melting in bits here and there we were safe till spring. Then it thawed and the coop flooded. Then well, we gave up. The french drain kept filling up with mud and eventually I just dug a hole straight down through it and the water ran down the hole, under the coop and out the back into the woods. That worked for about a year till it filled itself up too. 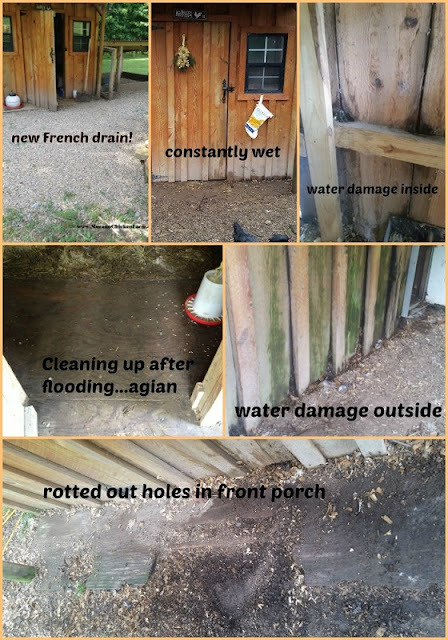 About this time it was discovered that the treated wood base that was supposed to last forever was rotting on the corner next to the run because (surprise surprise) there was no french drain in front of the 8 foot wide run and all the rain runoff was flowing down that way. Seriously, would another French drain have even helped? I doubt it. While this is just starting to go from bad to worse the Silkie house was being put in. Needless to say it was placed at the highest point in the opposite corner of the yard. This treated wooden base was set on concrete corner blocks and only touches the ground by the side door and a few feet in the back. The whole thing is set on a 6" deep bed of pebbles to assist in rain removal. Yes, we learned our lesson well. Back to the original coop though. There are holes in the porch floor. A piece of plywood is covering the foot square hole in the floor inside the coop where the coop meets the run. That wall is rotting in several places and the husband keeps threatening to burn it down. The porch is buckling and sinking but the coop itself is staying in place so it's creating a gap under the front wall. The gap under the door has increased letting in a squirrel who has destroyed pretty much anything and everything plastic in his search for scratch. Apparently he doesn't like layer feed which is freely available. Little brat! Squirrels are horrible to have around chickens, so this definitely needs to stop! What stinks the most though is that it's still a really cool looking coop and there is just no way to fix this without knocking most of it down! We've tried to figure out a solution but there really is none except to kiss the $1,500 we wasted on this thing goodbye as we watch it slowly rot to bits. Ugh! Frugal Chicken: What your chicken coop should include and 5 mistakes to avoid. Now this isn't to say that I haven't made different mistakes in other coops...but that's a topic for another day! 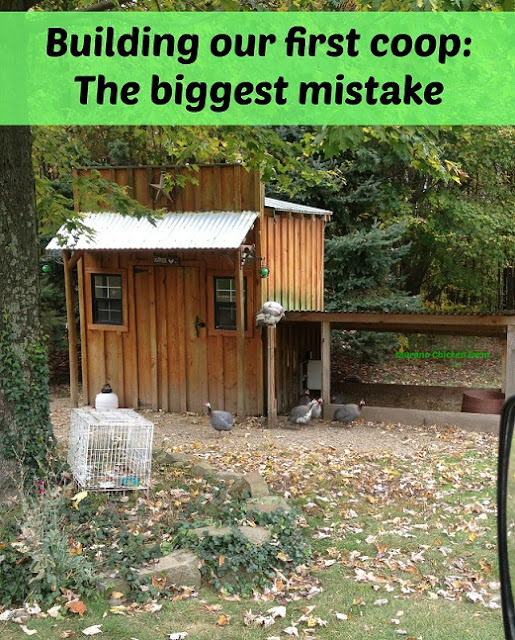 Did you make any mistakes when building your coop? Want information on raising chickens sent right to your email weekly? Click right here to join my list and get new posts sent directly to you the day they're published!